Feel Varadero Beach! It makes wonders! 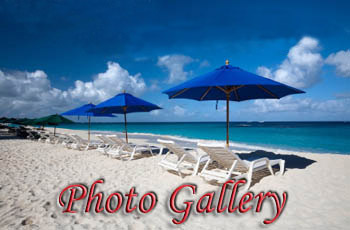 Guests of the Arenas Blancas Varadero Resort can soak up the warmth of the beach every minute of their stay. 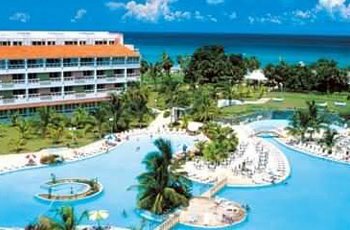 The Gran Caribe Hotel Club Arenas Blancas Varadero sits directly on Varadero Beach, and provides wonders for families, couples and singles. You only have to step out of the building to walk or jog along the 23 kilometers of white, warm, soft sand. It’s just like home... but barefoot. Wriggle your toes in the sand while soaking up the sun. Plunge into the cool, crystal clear blue sea. Breathe in the clean air. Arenas Blancas Varadero Resort will cuddle you whenever you want to relax in its cool air conditioned rooms and lounges, or when you want to rest by its quiet pool. 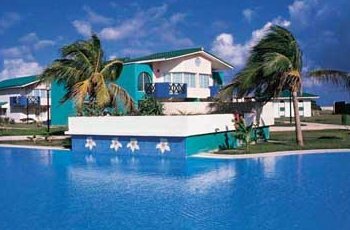 Arenas Blancas Resort sits right on Varadero Beach where you can walk or jog along its white sands and crystal clear blue sea. In addition, there are great restaurants and bars, tennis courts, beach and pool snack bars, massage therapists and great nightly entertainment. Want to get the best of the beach, the green and inside entertainment? Arenas Blancas Resort is directly on the sand and is surrounded by green gardens. It provides nautical sports for you to snorkel, take scuba-diving lessons, explore the coral reeves, wind-surf, row the kayaks or sail in the catamarans. The garden premises offer a variety of services in bars -where you can sip mojitos and daiquiris-, tennis court, daytime and evening entertainment. 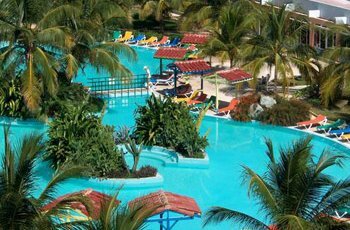 Arenas Blancas Resort also has restaurants offering Cuban and international cuisine, bowling, aerobics gym, sauna and massage facilities, and a discotheque with Cuban and international music. Arenas Blancas Varadero Resort personnel will take care of you during your stay, making you feel at home. You can enjoy walking through the town of Varadero Beach, experiencing the hospitality of its people. Visit the stores specialized in selling all trade marks of Cuban rum, cigars, art crafts, music to enjoy them here and take them home. But if you still want to feel a little more of Cuba, not far away from the Varadero Beach resorts, take an excursion to Bay of Pigs, to the city of Matanzas or to the Bellamar caves. Want to try a get-away from cooking? Restaurants and cafeterias at the Arenas Blancas Resort at Varadero Beach will cook for you, and you will enjoy each meal. Choices of restaurant range from a la carte to an international buffet. Treat yourself to fresh rich-scented papayas, pineapples, guavas, and other tropical fruits and vegetables all year round.The beach and pool snack bars will treat you to drinks and Cuban cocktails without ever leaving the beach. Remember to ask for “Tu Cola”, the Cuban version of Coca Cola. Enjoy Cuban rum cocktails as mojitos and daiquiris. Freshen up with Bucanero and Cristal beers. Arenas Blancas Varadero Resort offers All Inclusive Wedding programs. Imagine getting married on the white sands of Varadero Beach, dipping your feet in crystal blue waters. Picture yourself and your guests casually dressed up in white for the ceremony in the middle of winter. Toast with Cuban rum cocktails. Treat your guests to a tropical buffet. Or maybe you dream of an under water ceremony. Wedding coordinators will make your dreams come true whether it is your wedding, a marriage anniversary or the renovation of your wedding vows. Contact them, and they will take care of all the preparations from the wedding attires to the invitations. So relax. Wedding planning should be exciting and fun. You’re embarking on a journey that you’ll remember the rest of your lives. 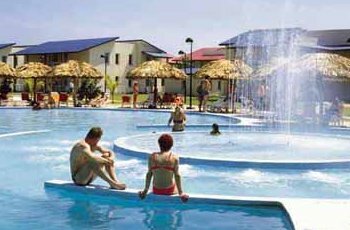 Second, chose Arenas Blancas Varadero Resort. Third, start packing for your all inclusive wedding in Cuba. All you have to do now is show up… and get married. The hotel, built in 1998, operates as All Inclusive Varadero Beach Resort. It has 338 standard double rooms, 16 triples, 4 junior suites and facilities for handicapped. It is located on 64 Street and First Avenue, Varadero, Matanzas.